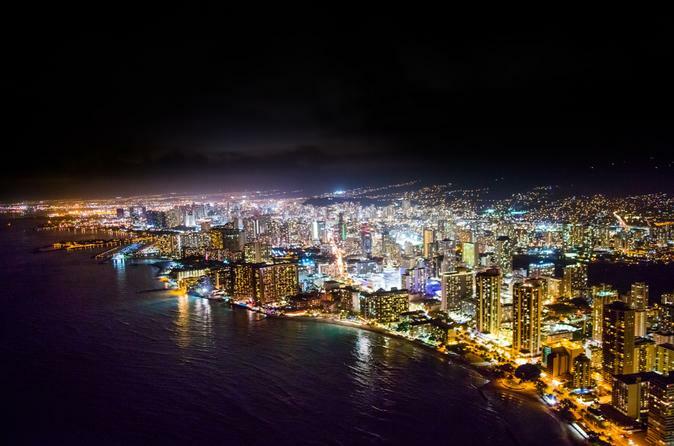 Enjoy the brilliant lights of Honolulu's skyline on Oahu's only night-time helicopter tour! The lights of Honolulu sparkle off the water and flow down the mountains like the lava which created our island home. A night-time passage over the illuminated USS Arizona Memorial is awe inspiring and only available with Novictor. Enjoy the romantic glow of the Honolulu skyline and the shimmering waters below on this exclusive nighttime tour of Oahu. As the city's lights turn on, your helicopter allows you to see them reflect off the ocean below and erase the boundary between land and sea. The city lights sparkle like stars and light your helicopter's journey along the South Shore. The Aloha Tower, Ala Moana Center, and the rows of hotels along Waikiki herald your passage and lead you to Diamond Head. After turning inland you can see the lights flow down Oahu’s hills and valleys to the sea, just like the lava which formed this island millennia ago. The city leads you to Pearl Harbor and your helicopter gives you a solemn passage above the soft lights of the USS Arizona Memorial. This night-time excursion is the perfect beginning to any night on the town.